From May 1–7 we celebrate National Pet Week, with a theme this year of “Save a Life, Adopt a Pet.” Desiring a pet is almost a universal experience of childhood. Usually, the term pet bring to mind dogs, cats, fish, hamsters, or other domesticated animals. 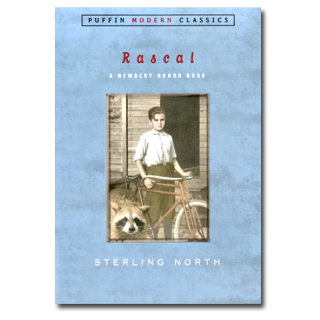 But, of course, a pet can be any animal that forms a bond with a human—and that is the case of the book of the day, Rascal by Sterling North. In this autobiographical story that takes place during World War I in rural Wisconsin, young Sterling North collects a menagerie of pets—a Saint Bernard named Wowser, cats, four skunks, and Poe, a crow. Very lonely, because his mother has died and his father is often absent, Sterling relies on these animals for company. Then one day he finds a baby raccoon. During the course of a year, the raccoon, Rascal, shares Sterling’s life. Sterling takes Rascal everywhere by placing him on the front of his bicycle. They go on fishing expeditions and share meals together. As is true to his species, Rascal washes all his food; in a hilarious episode, he discovers sugar cubes, only to watch them dissolve when he cleans them. But, of course, the raccoon is a wild creature destined for another life. In one of the great three-handkerchief endings in children’s books, Sterling realizes that Rascal needs to go back to live in the forest. Taking his friend out in a canoe, Sterling says: “Do as you please, my little raccoon. It’s your life…. Sterling never saw Rascal again. Sterling North had a very distinguished career as a critic and publisher, editor of the North Star books series for Houghton Mifflin. But he is best remembered for his Newbery Honor book Rascal—the biography of an unusual but beloved pet. So go play with your dog, pat your cat, feed your goldfish, and think about the role pets play in your life. My own would have been so much poorer without the beautiful brown eyes—and personalities—of Lady and Lancelot. So I am off for a walk! It was in May, 1918, that a new friend and companion came into my life: a character, a personality, and a ring-tailed wonder. He weighed less than one pound when I discovered him, a furry ball of utter dependence and awakening curiosity, unweaned and defenseless. Wowser and I were immediately protective. We would have fought any boy or dog in town who sought to harm him. Originally posted May 6, 2011. Updated for . My now grown son and I shared reading that together when he was just the age of Sterling. It is one of my fondest memories as a mother and he still claims it as one of his favorite books. All mothers of sons should take the opportunity to read this heartwarming, poignant, and bittersweet story to their boys. Thanks for the reminder of a timeless classic, Anita! Was wonderful seeing you! This book was my brother’s favorite story, and I think my parents must have read it aloud it us ten times. As a result of this book, every time a neighbor would get upset about raccoons in the trash we would get excited and wonder if Rascal had visited. I really believe that these sort of companion stories do so much for a reader’s feeling towards animals. Thank you for all the wonderful animal stories in the almanac! Wow, what a magical story! I love classics and books that connect you to different lifestyles, places and times. This one is a no-miss gem from what I see. After reading this review, I checked out the book reviews on Amazon and I saw really nice reactions! Great tip once again, Anita. Some would say that I’m now addicted to CBADA, but I’d say I’m just in love. PS. Yesterday the mailman delivered all four Mrs Piggle-Wiggle books and The Enormous Egg, which I ordered after reading CBADA. Thanks Almanac – you deserve a present too! I loved this book as a kid. I wanted a raccoon pal. I started eyeing the raccoons who tipped over our trash cans. They were kind of freaked out by the attention. None, I’m sad to say, turned out to be best friend material. Thanks everyone for the comments. Like Tobin and Sydnee, I longed for a pet raccoon after finding Rascal. I even put treats around my property in Vermont for a few years, hoping to find a buddy. Ah, well, at least we have our friend Rascal in book form. Read Aloud Dad — comments like yours are truly a present. I cannot thank you enough for this post! I had this book as a child and have been trying for years to remember what the name of it was. Rea: Thanks for that beautiful story. Marlene: This is one of those books that stands up over time, as wonderful to read as an adult as it is in childhood. Suzi: Yes, pick it up — get Kleenex. But at least not a dead animal book. You know, people hear me talk about James Harriot’s All Creatures Great and Small books, and the BBC series, and Rascal, etc. and they invariably say. Ah yes. Those were simpler and kinder days. Long gone. Long gone. That reaction always disturbs me. It’s just all wrong headed. If it’s long gone for them, they need to get back to children’s book. I believe for those of us that can manage it, we have a duty to create a legacy for children and each other by building at least a few life-time safe harbors of kindness and simplicity, and see to it that those are passed on. A lifetime collection of great children’s books, gardens, the sea, nature, construct some being, and not doing, as Jon Kabit-Zinn talks about. I know two people who have said that Children’s Books are the most important books to read in life. Period. One is Anita, and the other is Pullman. I’m beginning to get that. Rascal truly is a beautiful book. I read it aloud to my kids several years ago. We laughed and lived Sterling’s life along with Rascal every minute of the book. Thank you for highlighting this wonderful piece of writing. I still have a copy of Rascal on my bookshelf. Everyone in our family has read it.It evokes memories of my childhood, as I was lucky enough to spend my summers near Albion Wi, on Lake Koshkonong. It hadn’t changed much since Rascal was written. Sterling North’s words bring me right back there. I can hear and see my brothers, who were very much like Sterling. I remember our menagerie. Our raccoon friends were always named Rascal.Even though my children lived a different kind of childhood, they understand mine through sharing this book. hope it is still in print for others to enjoy. I read this book for the first time a few years ago. I have always been fascinated by raccoons, mainly because of my father’s stories about his own pet raccoon when he was little. his family adopted a baby raccoon whose mother was killed, and they made him a pet. his name was Hector, and when I read North’s book it allowed me to imagine what it must have been like to have a pet raccoon. It is also the classic story of letting go of something you love, which always bring tears to my eyes. This is one of the first books i read as a child. I also had three raccoon as pets at the time. Sam was born in captivity so he was very domesticated. He was a character and was very affectionate. Samson was two weeks old when my cousin took him out of the wild. He was around a lot but spent most of his time in the woods by our house in Methuen Ma. I wish i could have another for a pet again but there are laws now.